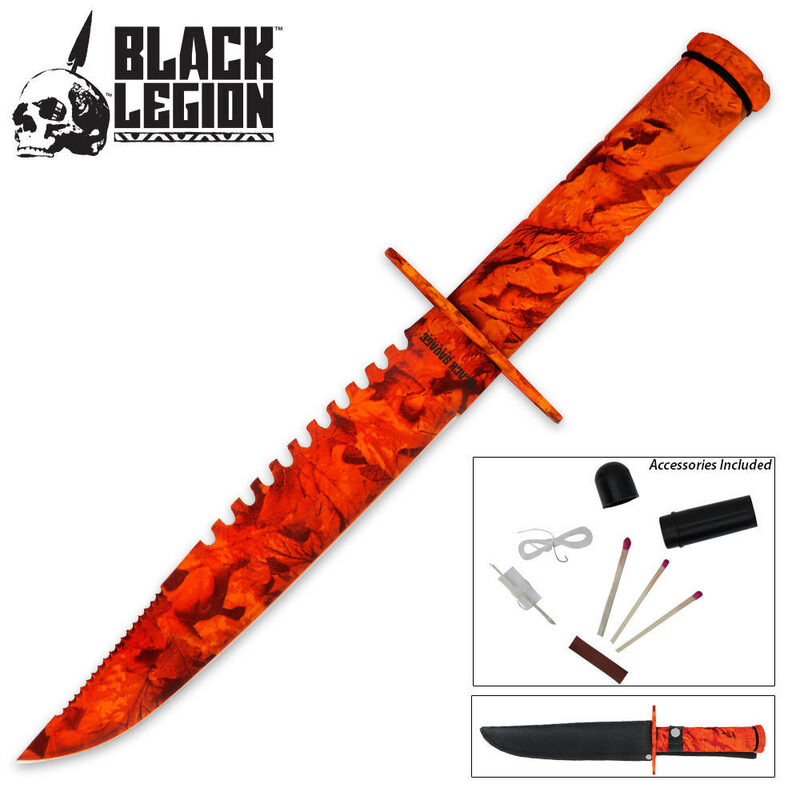 Black Legion Orange Camo Survival Knife & Sheath | BUDK.com - Knives & Swords At The Lowest Prices! You will be prepared to take on the jungle as long as you carry this Black Legion Jungle Fighter Survival Knife with you! The whopping 9" blade is crafted of solid stainless steel and features a partially serrated, heavy sawback design. I like this knife, made well and great color. Easy to find if dropped. About the only thing this one DOES NOT do is glow in the dark! Bright orange, yes. Hard to find in brush, no. This knife just feels good in your hand. It seems to be sturdy, but I have not put it through a true test. It is sharp.....great blade edge and just enough weight to give you some confidence when handling it. I expect it to be a very good companion and the price could not be any better. This is not a bad knife. With the orange color it will be easy to find when camping and things like that. I got this knife just to beat up and I'm going to do just that. The blade is not sharpe but that just gives me something to do while sitting by the camp fire and this will be the knife I will have at all times ...........get out and do something , be safe and have fun. Great knife comes pretty sharp out of the box.